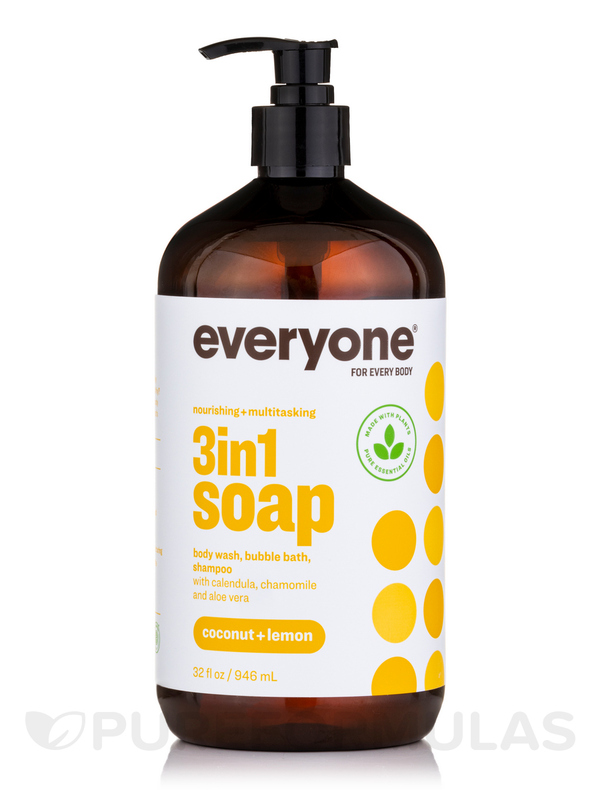 Everyone Soap 3- In- 1 (Shampoo, Body Wash, Bubble Bath), Coconut + Lemon by EO Products is excellent for our sensitive skin. Didn't irritate eczema either. 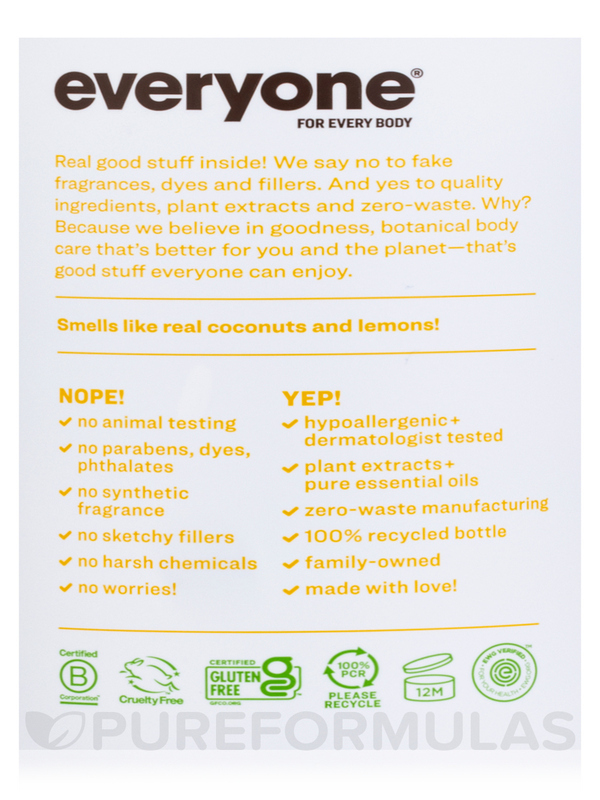 A Natural and Non-GMO plant-based soap scented with pure essential oils! This multi-tasking soap is formulated to be used as shampoo‚ body wash‚ and bubble bath. 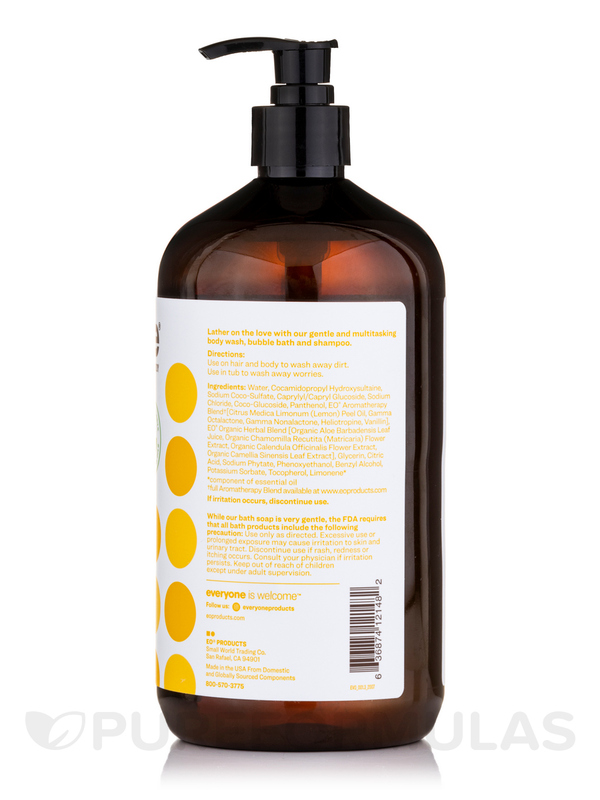 Blended with luxurious Coconut‚ bright Lemon essential oil awakens skin and transports the senses. Plant derived cleansers and botanical extracts create a skin-nourishing‚ foamy lather. 32 fl oz‚ generously sized for the whole family in recycled bottle. Purified Water‚ Cocamidopropyl Hydroxysultaine‚ Sodium Coco-Sulfate‚ Caprylyl/Capryl Glucoside‚ Sodium Chloride‚ Coco-Glucoside‚ Panthenol‚ Citrus Medica Limonum (Lemon) Peel Oil‚ Organic Cocos Nucifera (Coconut) Flavor Extract‚ EO Organic Herbal Blend [Organic Aloe Barbadensis Leaf‚ Organic Chamomilla Recutita (Matricaria) Flower Extract‚ Organic Calendula Officinalis Flower Extract‚ Organic Camelia Sinensis Leaf Extract]‚ Citric Acid‚ Sodium Phytate‚ Phenoxyethanol‚ Benzyl Alcohol‚ Potassium Sorbate‚ Tocopherol. Use generously as a shampoo‚ body wash or bubble bath. Rinse and enjoy soft‚ clean skin scented with pure essential oils. 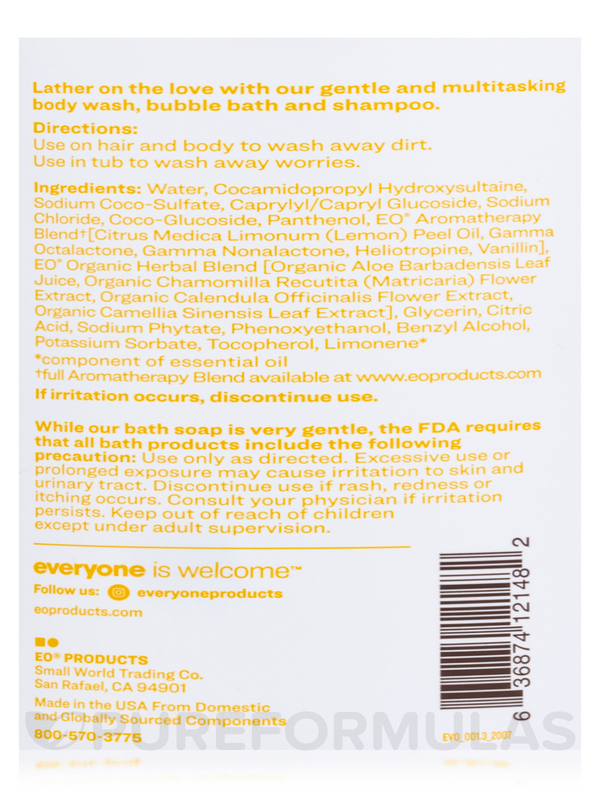 The 3-In-1 Soap by EO Products is really great and smells good! 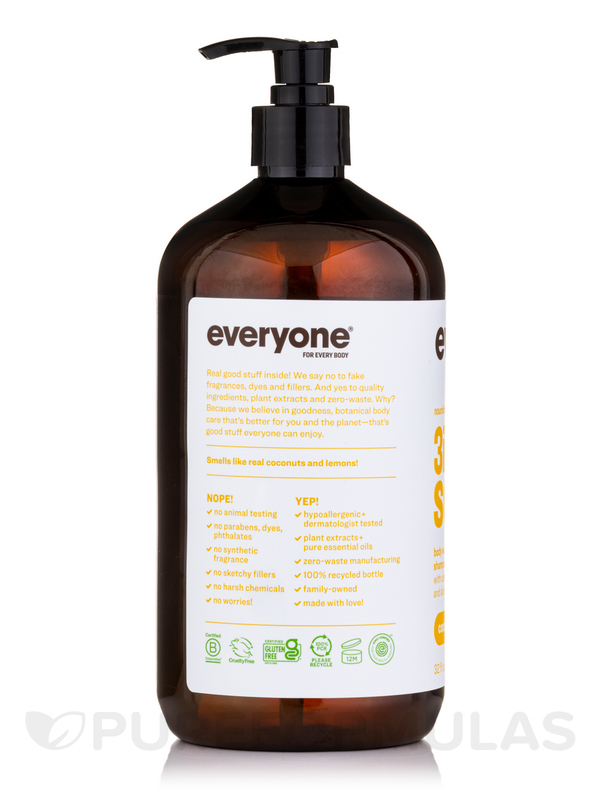 I love that I can use Everyone Soap 3- In- 1 (Shampoo, Body Wash, Bubble Bath), Coconut + Lemon by EO Products on my body and hair and the whole family can use.I ordered this product because of the ingredients. The product is everything I expected. No one recommended it, but I will recommend it to other's as well as the Pureformulas site.I love ordering and the product comes fast free shipping. I will order this product again, but maybe try a different smell.I really like the citrus mint, but figured I would try Coconut Lemon. Price,smell, ingredients and easily used by all people big and small! Pump bottle make easy use. I like the citrus mint flavor more, but this one is nice too!